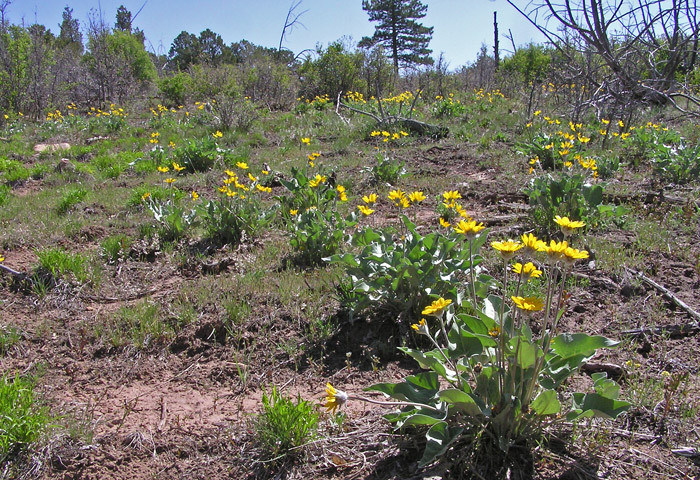 Arrowleaf Balsamroot is a big bright welcome to spring. 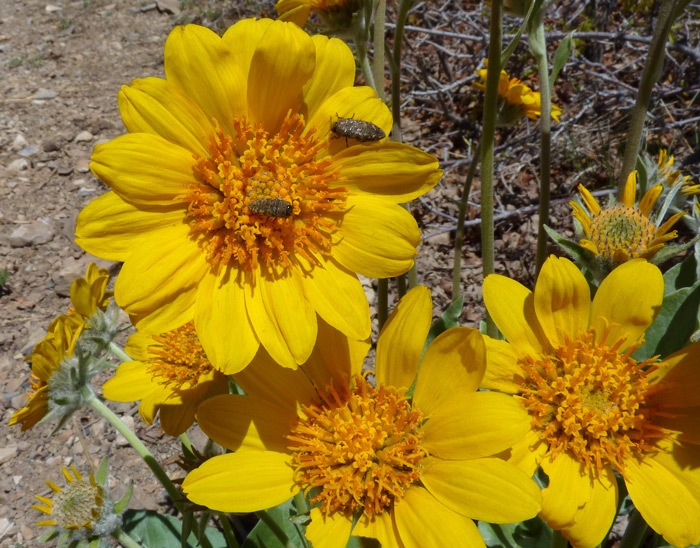 Its very large, bright golden/yellow flowers and large arrowhead-shaped leaves make it not only eye-catching, but also easy to identify. Arrowleaf Balsamroot might be confused with the equally showy Mule's Ears, but the leaves of the two are quite different: Balsamorhiza leaves are about four inches wide, six-to-nine inches long, and arrowhead-shaped; Mule's Ears leaves are two-to-four inches wide, up to sixteen inches long, and shaped like a Mule's ears. 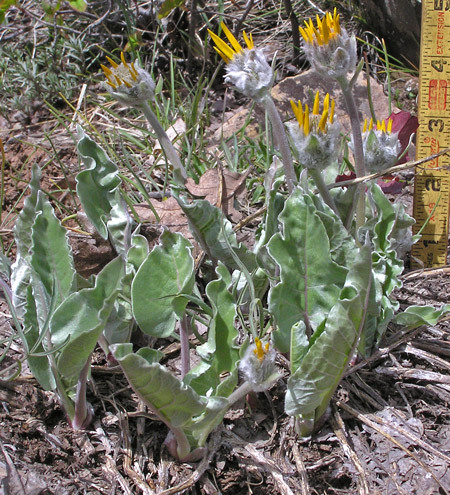 The overall Arrowleaf plant is usually several inches shorter with smaller flowers than Mule's Ears. 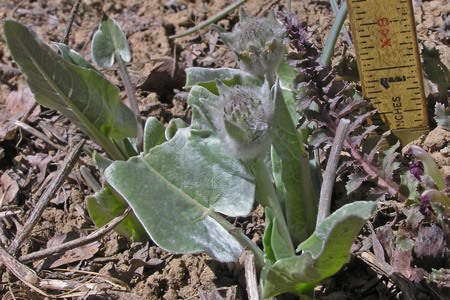 Arrowleaf also begins blooming several weeks earlier than Mule's Ears. Prater Ridge Trail, Mesa Verde National Park, May 1, 2006. 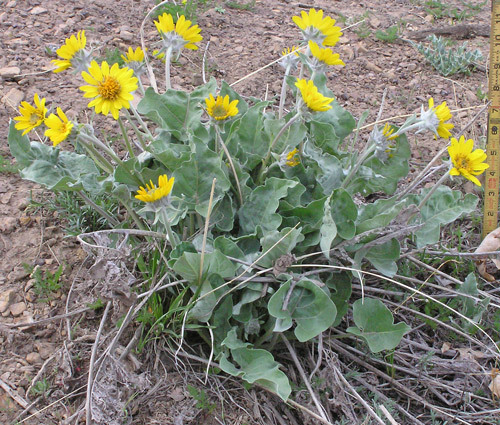 Arrowleaf Balsamroot has a single flower per stem appear above the arrowhead shaped leaves. After Arrowleaf's flowers die, the leaves wither quickly and remain brown and rattling in the wind all summer long. You can see last year's dried, gray flower stems and leaf skeletons especially at the bottom of the plant at left. Arrowleaf can be found scattered in small clusters in open woods or in patches of many plants in meadows. 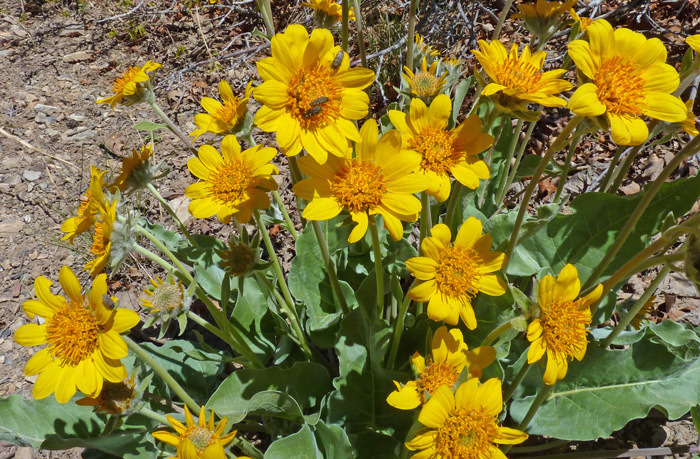 "Balsamorhiza" refers to the Balsam-like taste and smell of the root ("rhiza" in Greek), and "sagittata" is Latin for "arrow", as in "Sagittarius", the legendary archer. The first specimens of this plant were collected by Meriwether Lewis on the Lewis and Clark Expedition in the Rockies in 1806. 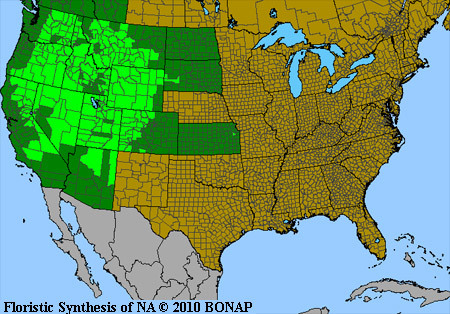 The plant was at first named Buphthalmum sagittatum by Frederick Pursh in his Flora Americae Septentrionalis in 1814 and then the genus was renamed Balsamorhiza by Thomas Nuttall in 1834. Mesa Verde National Park near entrance, May 1, 2006. Can Do Trail above Narraguinnep Reservoir, April 22, 2009. Dolores River Overlook Trail, April 28, 2008 and Sleeping Ute Mountain, May 6, 2012. 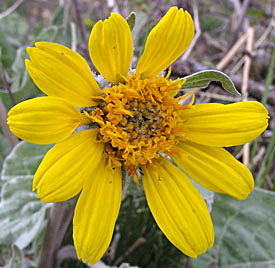 Balsamorhiza sagittata is usually noticed when it is a robust plant over a foot tall with three inch wide flower heads. In the top two photos at left, the plant is just a few inches tall with fuzzy half inch flowers and quite small hairy leaves. 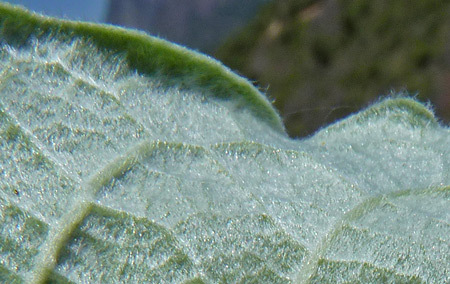 The third photo shows a close-up of the myriad of hairs on a mature leaf.